It's good to see HF conditions improving as the current Sun spot cycle slowly climbs higher, however the the Geomagnetic storms that it brings with it makes an FMT Nuts life a little more challenging. A moderate CME hit the earth on September 9th, but I think the effects lingered into our FMT period with noticeable results. Every one appears fascinated at the apparent shift in frequency as the 20 meter antenna is moved from East to West. If you have not done so already, take the time to listen to VE2IQ's wave file of the end of the 20 meter East run and the start of the West run. Thanks to all that participated , and special thanks to Isidro, EA8NQ for staying up late for this FMT. AF9A IN EM69wv Connie, signals on 20 were pretty squirly, lots of random phase reversals. 40 was good, S9+20. W6OQI was about 10dB out of the noise at best on both bands. Thanks! EA8NQ DX IL18ul RST: K5CM 20m:549, 40m:559; W6OQI 40m:439, 80m:329 (barely perceptible). RX: FT-897D. Antenna: G5RV Jr. + 80m loading coils. I simply used my rig, trying to match received carrier against the internal CW monitor. Yes, it is not of a "laboratory accuracy" but it was fun... hi. Best 73 and see you in next FMT. de EA8NQ, op. Isidro. K1GGI EMA FN41 K5CM on 40 often showed 2 rays almost .5Hz apart. On 20, wandered a couple tenths. Copy able all around just broad. K5BTK MS EM42 'Made it just in time for only the last run with zero warm-up. 'Always wondered how badly a stone-cold measurement would err! K6APW EB CM87uv Thank you Connie and Marvin for another FMT. Twenty meter west beam signal quite stable, forty and eighty not so. K6BZZ SDG DM13id Amazing conditions- very unsettled even on Marvin's S9+ signals. All that RF from the contests all weekend really messed up the ionosphere. Thanks for running the tests. K6IQL KS EM28NQ Thanks for a fun evening. I noted a sudden step function downward shift in the 20 M frequency of 1.3 Hz between the East and West runs. Measured and verified using two computers running SL. One processed and output text files in real time, the other recorded a .wav file and was post processed. Used my new audio calibrator to record a stable 1000Hz tone on the wave file to check for clock drift. There was none of significance. Two machines with different methods agreed to 11 mHz.Very strange. I will count the RF synthesizer next time. K9KK OK EM15 Signal strengths were weak to moderate. W6OQI on 80M was the strongest here in Central Oklahoma.. Still think your using an AM broadcast antenna. Doppler shift spread was 0.4HZ on OQI's 40M run. Thanks Connie and Marvin. RF, GPS disciplined generator, and Spectrum Lab. KD2BD NNJ FN20XD Lots of QSB and phase modulation on Marvin's carrier. KM6QX EB CM87 Used Flex-1500 GPSDO locked and SpecLab. Turned off AGC-T on Flex to hopefully see non doppler shifted peaks. KØMZ KS EM28ix Connie and Marvin, thanks for the FMT. The 20 meter East signal was slightly better than the West here in Kansas. Both signals were just above the noise level with Atlas 210X. Connie's 40 meter signal was very good. 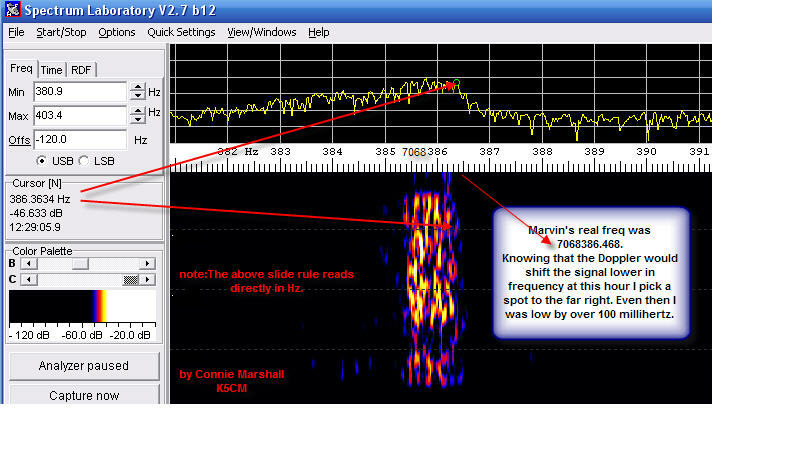 Marvin's 40 meter signal was also quite good and his 80 meter signal had a lot of QSB and quite a bit of doppler. I used a Heath HW-8 for the last 3 measurements. KU44PY AL em62wj Had to compete with a CW net that started during the 80m west coast transmission. N2GL OR CN85kp New setup for me. GPSDO locking everything. HP3335A synthesizer mixed with incomming unknown. TS450S 500Hz filter detector. Scope to peak audio signal. HP5335A counter aaveraging difference signal. Fading not too bad tonight. Maybe better in November. Thanks Connie and Marvin! N3FG EPA FM29 Thunderstorm produced hvy qrn during FMT. I could hear W6OQI, but qrn was too hvy for a measurement. So here is my best shot at K5CM. Used an IC-7200, WWV, and Spectran. Many tnx for another first class FMT. N4AU AL EM62vp Kenwood TS570 and Joe Taylor's WSPR/FMT program. Little problem here in Alabama with the 80M run. N5DM STX EL29fs Serious Doppler on W6OQI (40/80)in STX. TS-480 w/DigiPan v2.0 Doing it the hard way. Thanks guys. N5JOA NFL EM70vk Direct Frequency Measurement using SDR-IQ and Thinkpad T-20. Antenna is 260 ft dipole. N5LBZ MS EM53QV I am trying out a new setup for this test I am using K1JT Joe Taylor's FMT program. It will probably take a few runs b4 I get all the bugs worked out and learn how to calibrate the system correctly. Signals were not real strong on any band and on the 80m run someone started sending CW on the frequency and he was stronger than W6OQI so I only got a few good readings. He was doing this deliberately as he started right b4 the test and did not pause to listen. He stopped sending within 1 minute of the end of the run. VE2IQ ON FN15nt Didnt know K5CM on 160M(? ), K5CM 20M easy (heh! ), K5CM 40M and W6OQI 80M tricky: 2 good lines (I avgd), W6OQI 40M strong "wind" from right. Expect I'll be off by a mile on everything. Tnx for the fun. W0HBK IA EN-42 Ft-920 direct frequency measurement. Good signals. Thanks again for doing the test! W0PHD MN EN18oe K5CM 40 meter sig had LOTS of doppler levels were fairly good and QRN not that bad Thanks again guys..
W6OQI LAX DM04vf There appeared to be less doppler when K5CM was beaming east on 20 meters. Here in Southern California the signal was stronger when K5CM beamed west but doppler was less when he beamed east. W9TJ IL EM48 Dr. Doppler's revenge after nothing but straight white lines on the standard stations spectral displays that afternoon to these spreads for the FMT. K5CM 20 east 1.5 hz, 20 west 0.5 hz, K5CM 40 0.3 hz, W6OQI 40 1.0 hz, W6OQI 80 0.4 hz. Signals: K5CM 20 east weak fading, west 10 db better. K5CM 40 9+30. W6OQI 40 9+20 W6OQI 80 in the noise but readable. Between band conditions and computer I got more grey hair. Thanks to all for their efforts. W9ZB IN EM69xp All signals were usable, even the 20M directed away. I can usually get very close while the Morse is being sent, but I think W6OQI has a little phase jump when keying Morse. Key down is fine. But the doppler was huge on 80M. WA1ABI RI FN41jp Running on a temp antenna after a visit from Irene. Sigs were mostly good, although Marvin was a little light on 80. Thanks Connie and Marvin, 73 to all. WA4FJC VA FM08lf Trimble Thunderbolt, HP 3586B and Spectrum Lab as a tuning indicator. Nothing heard on 80M. Heard both east and west 20 M signals very well here in VA. I hope I didnt mix up my entry digits this time. Thanks Connie & Bert. WB6BNQ DX ???? Based upon an uncorrected IC-756proII timebase. Will need to fix that ! Unable to copy K5CM. WM1L EMA FN41qn Happened to be scanning the band when I heard the call for FMT. This is my best estimate using just my K3. A HP Z3801 GPS frequency source clocks a HP-3336B. A 10 db transistor amp follows and drives a 12BY7 / pair 6146. Then to the final amplifier, a Dentron 2500 running 350 - 500 watts out on 80, and 20 meters. There are no mixers or any device in the chain of amplifiers that might impact the accuracy of the GPS frequency source. As a reality check, I periodically log the frequency source against WWV and other GPS referenced sources. I monitor each transmission with a completely separate receive system to look for any instability or short term drift. The separate system is not locked to the GPS transmitting system, but to another GPS source.